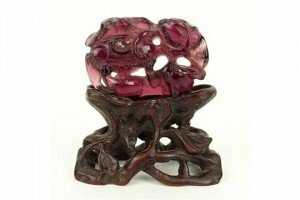 A late 19th century Chinese carved amethyst figure, mounted on a heavily carved natural wood base. Bears a four character mark to the bottom. 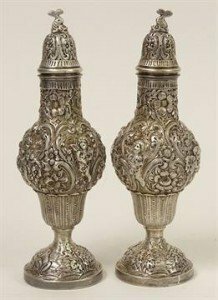 A pair of repousse continental silver salt and pepper shakers, the repousse pattern represents angels playing music amongst the flowers, the pierced tops each having a carved koi fish. 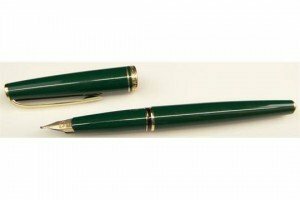 A German Montblanc Meisterstuck generation green fountain pen. The nib 14 carat gold. 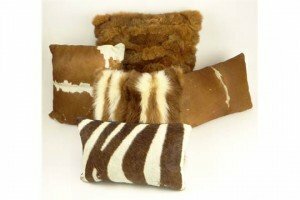 A set of five different sofa cushions of square and rectangular form, each covered with different real animal hyde, cow, zebra etc. 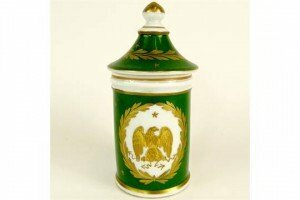 An antique French hand painted porcelain jar and cover, decorated with an eagle within a wreath on a green ground. Signed to the bottom in a French signature. 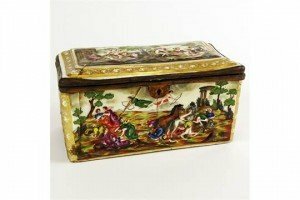 A 19th century porcelain trinket box mounted with bronze, hand painted with a scene of battle. 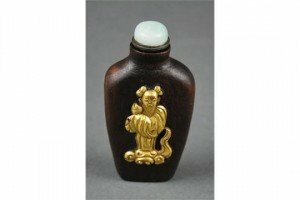 A Chinese hard wood snuff bottle and stopper of vase form, decorated to the front and back with an applied gilt metal immortal. 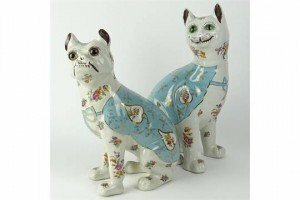 A pair of comical pottery figures of a seated cat and a French bulldog, each figure embellished with glass eyes and hand painted with a floral spray. 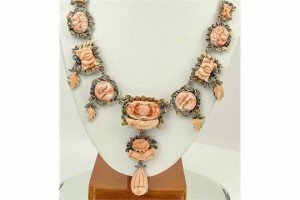 A ladies vintage carved coral and multi stone 10 carat yellow and white gold statement necklace. 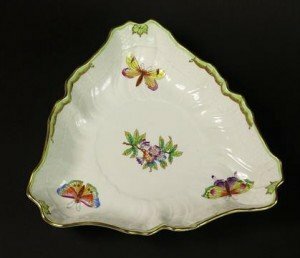 A Herend porcelain Queen Victoria bowl of triangular shape. Hand painted with butterflies and floral motifs, Signed to the back. 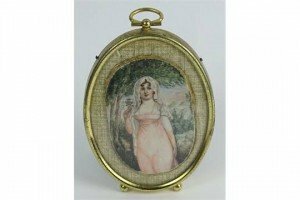 A late 19th century painted ivory miniature of a lady in pink, agains a forest scenery. 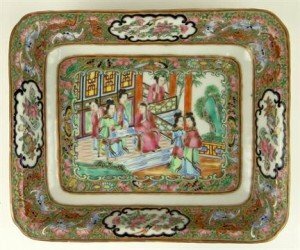 Framed in an oval gilt metal frame. An early 20th century Chinese export porcelain rectangular rose medallion bowl. Bears a four character mark to the base. 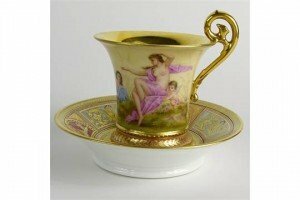 An antique Royal Vienna porcelain portrait cup and saucer, decorated with a romantic scene and gilding to the edges and inner area of the cup. Signed to the bottom with blue beehive mark. 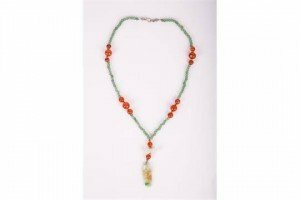 A Qing Dynasty period Jadeite pendant necklace in tri colour tone, white, green and yellow, the pendant carved as a buddha hand. 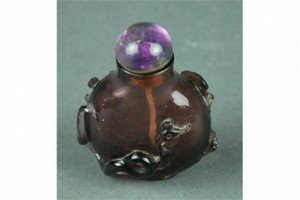 A small Chinese carved amethyst glass snuff bottle and stopper of spherical form, carved with a turtle and a serpentine admits swirling clouds. 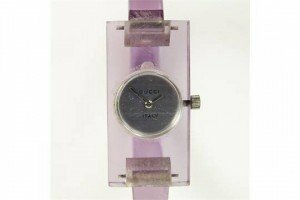 A vintage Gucci Italy watch, having swiss movement on a purple lucite bracelet. signed to the back ‘Gucci Italy’. 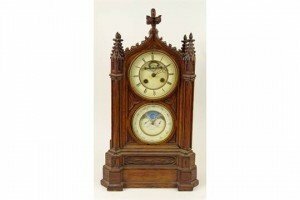 A 19th century French gothic style Howell & James moon phase mantel clock. 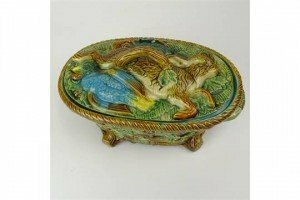 An early 20th century Majolica glazed porcelain dish and cover, hand painted with a hare and bird motif. 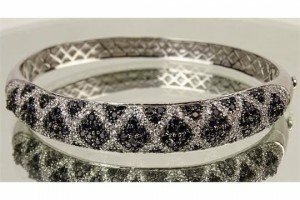 A ladies diamond, sapphire and 14 carat white gold bangle bracelet. Signed to the rim 14K. 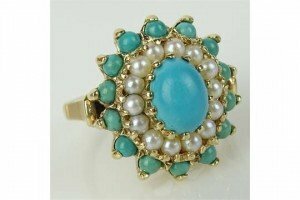 A ladies 10 carat yellow gold cocktail ring, embellished with turquoise and seed pearls. Signed 10K to the shank.